Total public agricultural R&D spending in West and Central Africa increased after a period of stagnation spanning most of the 1990s. Just two countries, Ghana and Nigeria, were responsible for most of this investment growth, which was largely the result of increased government commitments to improve incommensurately low scientist salary levels and to rehabilitate neglected infrastructure after years of underinvestment. The majority of the subregion’s francophone countries, on the other hand, reported either declining or extremely volatile trends in their annual agricultural R&D spending levels. National investment levels in countries like Gabon, Guinea, and Niger have fallen so low that the impact of agricultural R&D on rural development and poverty reduction in these countries is questionable. 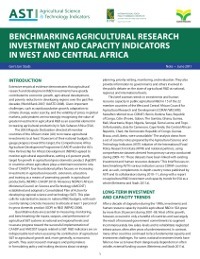 Like R&D investments, total agricultural R&D capacity in West and Central Africa has also increased since the turn of the millennium, but significant growth in R&D capacity in Nigeria overshadowed declines in countries like the Republic of Congo, Niger, and Togo. In addition, most of the new recruits in Nigeria were junior scientists with only BSc-degree qualifications, with the result that the average levels of degree qualifications of agricultural research staff deteriorated during 2001–08. A large number of countries also reported prolonged recruitment freezes combined with the retirement and departure of senior staff, limited training opportunities, and an overall ageing pool of researchers. Nevertheless, on average, West and Central African agricultural researchers are still more highly qualified than their colleagues in other parts of the continent. Many countries in SSA, particularly the francophone countries in West and Central Africa, continue to be highly dependent on unstable inflows of donor funding and development bank loans. In many instances the completion of large donor-financed projects precipitated severe financial crises in these countries, quickly eroding many of the gains achieved. The long-term nature of agricultural R&D highlights the need for stable long-term funding to ensure that advances in national agricultural research system can be sustained and built upon. Hopefully WAAPP and other new projects in the region will be able to address some of these issue so that funding levels can be stabilized long term. Building on the strategic recommendations of various highly influential reports and meetings, and taking into account the various investment and capacity challenges outlined in this report, the following key policy areas must be addressed. National governments must counteract decades of underinvestment by providing higher and more stable levels of funding to public agricultural R&D and by creating a more enabling environment for private-sector R&D. They will need to identify long-term national R&D priorities and design relevant research program accordingly, while donor funding needs to be better aligned wit these priorities. In addition, governments (and donors) mus urgently address human capacity challenges in agricultural R&D Investment in agricultural higher education needs to be enhance to increase the number and size of PhD and MSc programs an to improve the curricula of existing programs. Finally, given that many small countries lack the required critical mass to produce and access relevant, high-quality research outputs, agricultural R&D must be maximized at the (sub)regional level.